Shot (or “two-tone”) polyester taffeta. Simply put, polyester is plastic. Actually, Wikepedia tells me that the word polyester applies to a “category of polymers that contain the ester functional group in their main chain”, whatever that means. Around here, polyester refers to the synthetic fiber that is woven into a yarn referred to by the same name. Polyester gets a bad rap. Everyone thinks of the 1970s and Crimplene when polyester is mentioned but there’s a reason why, despite that, we still use it today. It’s cheap, it’s versatile and it can be extruded in whatever thickness the ultimate purpose of the fiber requires. It resists stains and creases and can be cleaned with relative ease. Polyester yarns are used for a lot of things – from everyday clothing, outerwear, upholstery fabrics, to stuffing for cushions and industrial coverings to name but a few things. Polyester is often blended with other fibers such as cotton and wool to minimize disadvantages of each. Cotton-poly breathes better than pure polyester, but shrinks less than cotton. Wool-poly offers the heat-retaining characteristics of both, but at a lower price than wool and with a nicer texture than pure polyester. Polyester is machine washable, but should only go in the dryer on low heat. It’s plastic, and plastic melts. With that in mind, you should also use extreme caution (and a press cloth) when ironing it. But the stuff rarely wrinkles, so that’s unlikely to be an issue. Usually just letting it sit on a hanger will take care of any creases that might occur. This can make sewing with it a challenge if you need to press seams open and flat. You can’t put a permanent crease in polyester without some serious equipment. One criticism of polyester that is totally justified is how uncomfortable it can be to wear, especially in its purest form. Polyester holds heat like a plastic bag and doesn’t breath like cotton or linen will. Polyester can be found in every color of the rainbow, usually because it was extruded in that color in the first place. As a rule it does NOT take dye – especially not the kind of dye you throw into your washer. You can dye some artificial fibers at home, but it’s a bit of a pain. Beware of the creature called “China silk”. 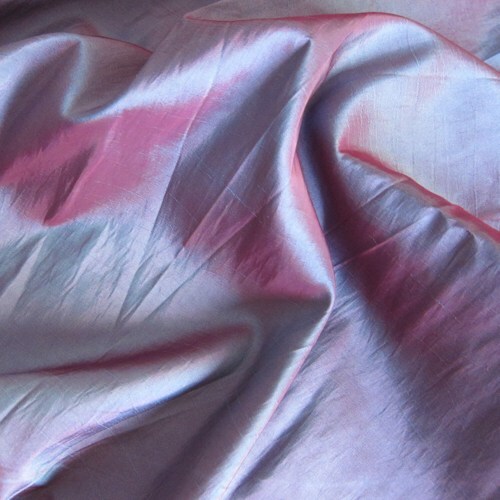 It’s a polyester fabric which is marketed as an alternative for silk. It’s a lightweight plain weave, usually very smooth and slippery. It can make for a great lining, but it’s not silk.